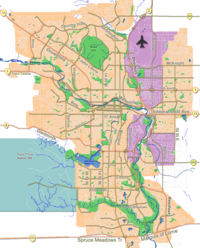 Baitun Nur (also spelled Baitunnur or Baitun Noor) (Arabic for "House of Light") is a mosque of the Ahmadiyya Muslim Community in the Castleridge community of Calgary, Alberta. It is known for being the largest mosque in Canada. It is estimated that there are about 3,000 members of the Ahmadiyya Muslim Community in Calgary, which would make it the largest mosque in North America. The cornerstone of the mosque was laid in 2005. Construction was completed in 2008 for an estimated self-funded cost of C$ 15 million, with roughly C$ 8 million of that coming from local Ahmadi Calgarians. Baitun Nur had its grand opening to the public on July 5, 2008, with 5000 people in attendance, including dignitaries such as Canadian Prime Minister Stephen Harper, Opposition Leader Stéphane Dion, and Calgary Mayor Dave Bronconnier. The Roman Catholic Bishop of Calgary, Fred Henry, attended as well. Mirza Masroor Ahmad, the supreme head of the worldwide Ahmadiyya Muslim Community, oversaw the opening. While members of various faiths were invited, according to Kaufman of the Edmonton Sun, the Sunni Muslim group Islamic Supreme Council of Canada, led by Syed Soharwardy, was not invited, due to its belief that Ahmadiyya Muslims are not "real" Muslims, and did not consider Baitun Nur a "mosque." Praise for the Ahmadiyya Muslim Community came from attendees, including Harper, who said "Calgarians, Albertans and Canadians will see the moderate, benevolent face of Islam in this mosque and the people who worship here." According to Embassy magazine, regarding Harper's remarks, a governing party insider said "It's an important signal the prime minister is sending, not just to militant Islamists abroad, but to their sympathizers here at home, that he's perfectly prepared to ignore them and side with persecuted minorities within the faith." The mosque complex is 4,500 m2 (48,000 sq ft) in size. A 97 feet (30 m) tall steel-capped minaret tower and large steel dome are the most noticeably externally visible features of the mosque. Around the exterior of the building are written 99 Arabic words, each an attribute of Allah's character as stated in the Qur'an. In addition to a place of worship in Calgary, the mosque complex includes classrooms, office space, a children's area, a kitchen and a community centre. In the prayer hall of the mosque hangs a 400-kilogram chandelier that cost $50,000. Baitun Nur is the seventh Ahmadiyya mosque by Naseer Ahmad who gave consultation to. Manu Chugh Architects. ^ a b c "Canada opens its largest mosque". afp.google.com. AFP. 2008-07-05. Retrieved 2008-07-12. ^ a b c d e f g h Morton, Graeme (2008-07-05). "Politicians and faithful open Canada's largest mosque". canada.com. Canwest News Service. Retrieved 2008-07-12. ^ Morton, Graeme (2008-07-06). "Canada's largest mosque opens in Calgary". Calgary Herald. Canwest. Retrieved 2008-07-12. ^ a b c "Harper: Mosque shows 'benevolent face of Islam'". ctv.ca. The Canadian Press. 2008-07-05. Retrieved 2008-07-12. ^ "Big mosque on the Prairie opens in Calgary". cbc.ca. CBC News. 2008-07-05. Archived from the original on 10 July 2008. Retrieved 2008-07-15. ^ Jeffrey, Jones (2008-07-04). "Small Muslim community builds Canada's biggest mosque". ca.reuters.com. Reuters. Retrieved 2008-07-14. ^ a b Kaufman, Kaufman (2008-07-12). "New mosque a bridge to other faiths". Edmonton Sun. Canoe Inc. Archived from the original on 2008-10-11. Retrieved 2008-07-14. ^ a b Davis, Jeff (2008-07-09). "PM Stirs Debate By Cozying Up to Moderate Muslims". Embassy Magazine. Hill Times Publishing Inc. Archived from the original on 2010-08-19. Retrieved 2008-07-14. ^ a b c Platt, Michael (2008-06-23). "Calgary's $15M not-so-little mosque on the prairie -- the largest of its kind in Canada -- will officially open July 5". Calgary Sun. Canoe Inc. Retrieved 2008-07-14. ^ Morton, Graeme (2008-06-29). "Muslims open new house of worship: Calgary's new northeast landmark is Canada's largest mosque". Calgary Herald. Canwest. Archived from the original on 2008-10-12. Retrieved 2008-07-13. ^ "Canada's largest mosque under construction: Manu Chugh Architects act as local architect for the largest mosque in Canada". WorldArchitectureNews.com. 2008-01-15. Archived from the original on 14 July 2008. Retrieved 2008-07-15. Wikimedia Commons has media related to Baitunnur.